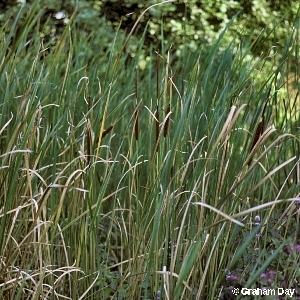 This is very similar to Typha latifolia and grows in similar wet places: fens, lake-shores, ditches etc., but is less common. It differs from T. latifolia by its narrower leaves and by usually having a clear gap between the male and female inflorescences. The male flowers are produced below the female spike, which forms a thick brown dense mass, later breaking up and allowing the fruits to disperse by wind. The whole plant can reach about eight or more feet in height, but it dies back completely in the winter, new shoots being produced from the underground creeping rhizomes. All names: Typha angustifolia L.